Fr Hunwicke's Mutual Enrichment: "De facto Schism": a useful new theological category of analysis? "De facto Schism": a useful new theological category of analysis? A year or two ago, Cardinal Mueller suggested that, although the excommunication of its bishops had been lifted, the SSPX was still in de facto schism. At first, I disliked this idea, because it seemed to nullify the emollient effects of the removal of the excommunications, as intended by Benedict XVI. But, upon lengthier thought, I came (as I usually do ... honest, no irony here ...) to the conclusion that his Eminence is right. After all, with whatever justification, the SSPX does not have any recognition in Rome or throughout the world-wide churches which are in unflawed communion with the Holy Father. De facto there is no communicatio in sacris between SSPX clergy and a diocesan bishop. They do not attend his Chrism Mass; I imagine it is pretty certain that he does not invite them. Do they use Chrism he has consecrated?? Or, "ex necessitate", do they use Chrism consecrated by a bishop who may be more orthodox than their diocesan but who does not have a canonical missio from the Holy See and does not even claim to possess even a titular episcopal see? 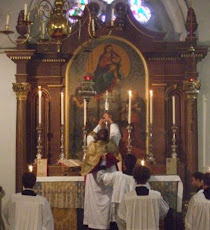 And who does not fulfil the ancient custom of going formally ad limina Apostolorum? To call this a de facto schism, which after all does imply that the Society is not in a de iure schism, and thus is not canonically schismatic, does seem at least arguably to be a useful analytical category. Dear Fr. If you need a bag-carrier on your way to the Roman palazzo of the Order of Malta . . . In the immortal words of the late Prof. John Senior: "If Weakland is in, whose out?". Fr Hunwicke, how did you mange to post this at10:54 which is the date of the Great Schism? Very clever! Our young, new father at FSSPX did not mentioned with a single word that the Diocese got a new archbishop, and - as it could be expected - did not join the chrism mass. But he mentioned the names of the Pope and the new arch Bishop in the Holy Friday liturgy (along with the 1962-version of the prayer for the Jews, by the way, in difference to the last years with elder FSSPX-clergy using the pre-1955 version of this prayer). You could call this "de-facto schism". But I think, heterodox clergy will never get into such Position; they have no problem to join the chrism mass like performed here, with even clergy (like many of the attending lay people) using the clearly forbidden "dipping method" during the communion under both species. I saw the Drops on the floor under the shoes and could not join anymore the communion under such sacrilegious conditions. But the Lord was quietly suffering. Very droll, Father. How amusing to contemplate such a conclave, sorry, committee, meeting purposefully at the Villa on the Aventine Hill, with that magnificent view of the Dome of St Peter's in the distance… I do hope your jokes about multiple Popes, and now schism, are but attempts at teasing your readers! I was wondering if there was also a category of 'de facto' heretic, and then remembered that it's usually called 'material heresy'. Is 'material' and 'de facto' the same thing, do we think? Perhaps Cardinal Marx and his fellow rebels will be starting a "Church of Germany" with its own rites. They seem to have plenty of money to play with. There is real danger of schism stemming from the second session of the Synod on the Family. If elements, particularly bishops, in the Germanic Churches persist in permitting those in an objective state of mortal sin and therefore not in a state of grace, to receive Holy Communion, then we have schism. It is an act of disassociation from the Mystical Body of Christ. In many ways it is worse than the Greek Schism which did not involve specific doctrinal belief. It is akin to the Protestant Reformation which denied aspects of Tradition and the teaching of the Magisterium. It is certainly much worse than the SSPX schism. And lets be clear. This does not just involve a limited clique of Germanic bishops. Because of widespread ignorance of the Faith and the loss of the sense of the Sacred in the liturgy, these schismatic bishops will find a wide following not just in Europe, but elsewhere in the Americas and in the Philippines. There is now a danger of another Reformation.